Since this subject has no official name, the name Boulder is conjectural. This article is about the rocks that fall from the sky. For other rock-like objects, see rock. Several boulders falling at once. Boulders are obstacles in the Pikmin series. They are large rocks that fall from the sky, often in groups, and can crush anything they land on. They can be identified by the growing shadow they cast on the floor as they fall, as well as the sliding whistle sound that accompanies their descent. These signs give players a warning that a rock is about to fall where the shadow is, giving them time to get out of the way. It should be noted that boulders in Bingo Battle fall faster than the ones in Pikmin 2. Rock Pikmin are also immune to boulder attacks in Bingo Battle. With ideal placing and timing, players can trigger a boulder drop such that it lands on top of an enemy, causing massive damage to the creature. Sometimes, if two boulders spawn close together, they can bump each other apart when they get close enough to the floor, in Pikmin 2. In caves, boulders can fall from the ceiling by themselves when a leader or Pikmin gets close to their spawn point. The Empress Bulblax and the Segmented Crawbster can make boulders fall from the ceiling when they slam against a wall. These boulders spawn where the active leader is at. In 2-Player Battle and Bingo Battle, a cherry power-up allows players to drop a shower of boulders where their opponent's active leader is. 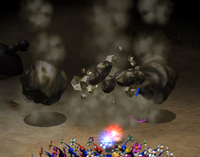 Because some of these triggers spawn boulders where the active leader is, players can anticipate a boulder downpour and quickly switch leaders to avoid having the boulders drop on leaders that have several Pikmin following them. Cave of Pain: 8 boulders. Frontier Cavern: 13 boulders in sublevel 7. Shower Room: 3 boulders in sublevel 1. Cavern of Chaos: 10 boulders in sublevel 3. Hole of Heroes: 1 boulder in sublevel 7. Dream Den: 4 boulders in sublevel 12. Main article: Boulder jump glitch. It is possible to exploit a glitch in the way the game handles lying down, and using it to make the leader jump quite high. By lying down in a specific time while a boulder is dropping on the leader, he will be sent flying into the air. For information on the rocks that lithopods spit, see Armored Cannon Larva technical information. A boulder falling from the sky in Pikmin 2. A boulder falling from the sky in Pikmin 3. This page was last edited on April 24, 2019, at 17:30.